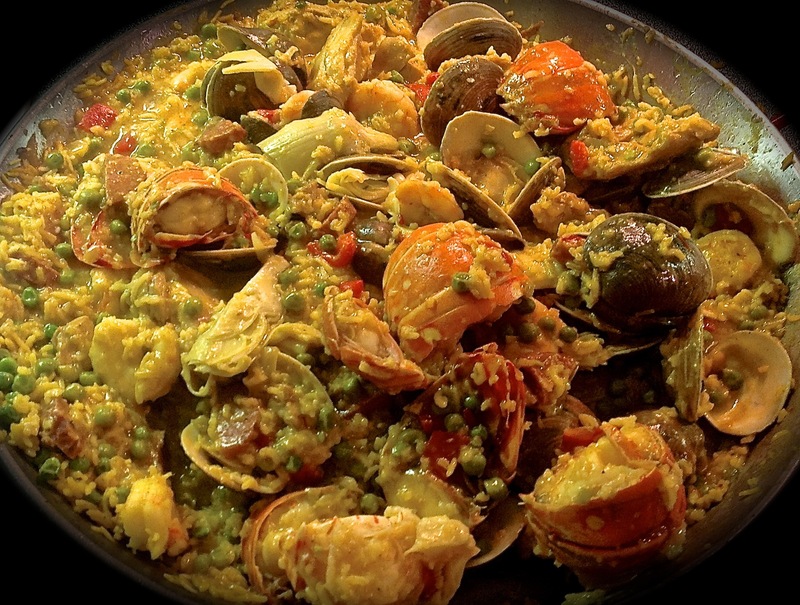 The secret to great paella is to be vigilant during the cooking process, constantly turning the mixture as ingredients are added, while simmering on low heat. 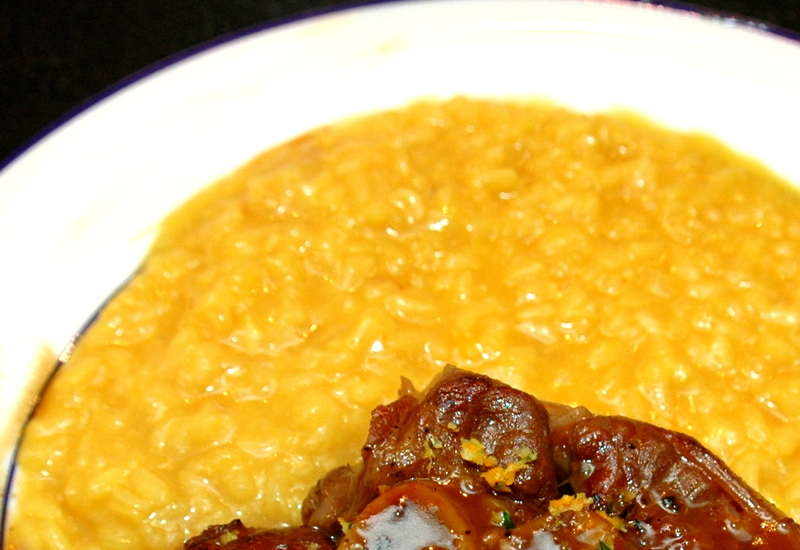 The rice should be moist, sticky and tender when finished, so taste it periodically during the cooking. Make no mistake about it, paella is not a ‘fast food’, but the attention it requires is repaid by a delicious and most enjoyable meal. Special equipment: a carbon steel 12 to 14 inch paella pan, a wooden spoon for stirring and large spatula for turning. Total preparation and cooking time: 1 ½ to 2 hours. Serves 4 to 6 people. 1. Heat the olive oil on medium and brown the chicken. 2. Remove and set aside the chicken, add and melt the butter. 3. Add onions, sauté until translucent. 4. Add 3 cups of chicken stock and bring to a low boil. 5. Add saffron and stir well, then add the rice. 6. Cook over low-medium heat for about 15 minutes, stirring constantly. 7. Add back the browned chicken, then the chorizos. 8. Add the peas and remaining cup of chicken stock, reduce heat to low. 9. For the next 30 minutes add and stir constantly the following ingredients: mussels, clams and lobster meat. 10. When clams begin to open, add the wine and cook 5 minutes. 11. Add the shrimp, peppers and artichoke hearts, stir until shrimp turn pink approximately 15 minutes. 1 pinch of Saffron threads, about 1/8 tsp. 1. Heat the chicken stock in a small pot. 2. Remove one cup of stock and add the saffron and set aside. 3. In a separate, 3 qt. pot, heat the olive oil on medium, add 3 tbsps. butter to melt, stir well. 4. Lower the heat; add the scallions and sauté for 2 minutes. 5. Add the rice, raise heat to medium, and stir well for about 4 minutes to coat each grain of rice. 6. Add the white wine, continuing to stir until the wine is absorbed. 7. Add the set-aside cup of stock with saffron and keep stirring until all of the liquid is absorbed. 8. Add a second cup of stock from the heated pot and add a handful of arugula, stirring well until the arugula becomes limp and the stock is all absorbed, about 3-5 minutes. 9. Continue this process until all of the arugula and 7 cups of stock are used, leaving one cup still heated in the small pot, which will be added at the end. 10. In the meantime, heat the remaining 2 tbsps. of butter in a sauté pan, add the scallops and shrimps and sauté on high heat for three minutes. 11. Pour the remaining ½ cup of white wine over the shrimp and scallops and continue to sauté until most of the wine is absorbed. Sprinkle with the paprika and add to the rice after step 9. 12. Add the Parmigiano-Reggiano, as well as the one remaining cup of stock, mix well and serve immediately. Serves 4. Active preparation time 30-45 minutes. 1. Bring chicken broth to a boil in a 2 qt. pot. Reduce heat to low and keep warm. 2. Remove 1 cup of stock and add the saffron threads. 4. Add the rice and cook for several minutes, stirring to coat each grain. 5. Add the cup of the warm chicken stock with saffron and cook, stirring, until the rice has absorbed the liquid. 6. Add the remaining stock, 1 cup at a time. Continue to stir, allowing the rice to absorb each cup of stock before adding the next. 7. Test the rice for doneness, it should be al dente but creamy smooth. 8. 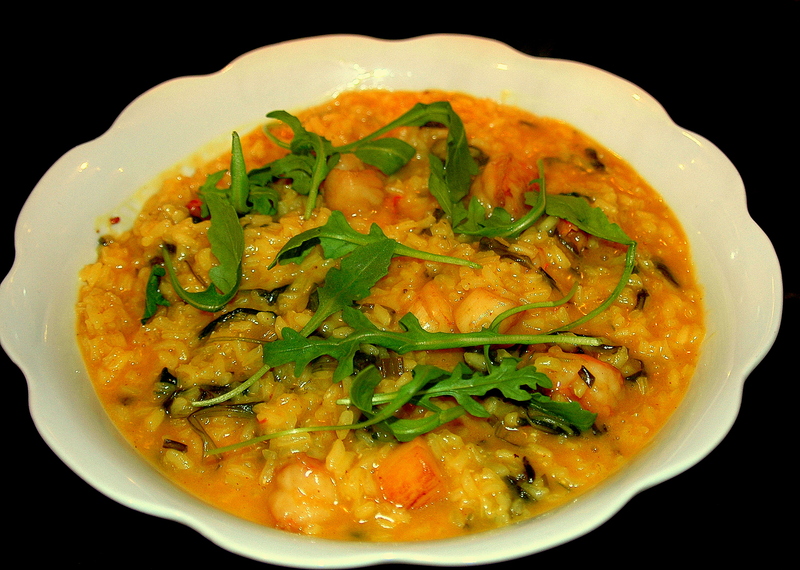 Remove risotto from heat, add grated cheese and black pepper. Serve at once with Osso Buco Milanese.